Yes, you read correctly, rice made out of cauliflower. Cauliflower is a great for alternative for rice and this way you do not miss your side dish of rice along your stir fry! It is a much more healthy alternative to rice and a great way to sneak some vegetables into your day! You can spice up this dish if you so wish with a dash of pepper or perhaps with an additional vegetable. I add eggs here to make this a version of egg fried rice. This can be optional and you could just use the flavourings to fry up the cauliflower. I do not use soy sauce due to the hidden wheat content in it but use a similar sauce called Tamari. This is made from soybeans and I purchase mine from my organic food shop. It makes a great gluten free alternative to soy sauce, and personally I find it less salty to my taste. 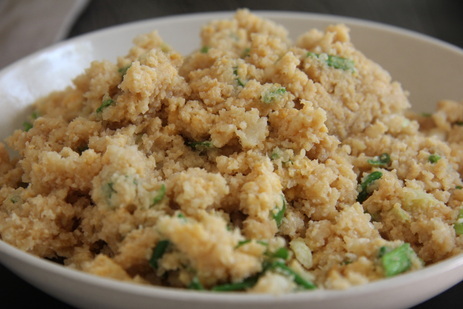 To grate the cauliflower, you can throw it in a food processor with the grater or simply grate the cauliflower by hand. Heat the oil in a wok or large frying pan and add the cauliflower and garlic. Stir fry until the cauliflower is nearly tender, but not mushy. Stir in the Tamari sauce and mix well. Push the mixture to the side of the pan and add the beaten egg. Lightly scramble the egg, then mix into the cauliflower. Add the green onion and mix well. 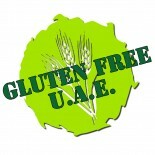 This entry was posted on 06/02/2012 by glutenfreeuae in Cooking, Recipes and tagged fake rice, gluten free, glutenfree, low carb.